I became acquainted with the work of Richard Osborn when his piece, “A Dream Of Distant Summer,” appeared on Beyond Berkeley Guitar.¹ Work & Worry had the good fortune of interviewing each guitarist associated with that collection prior to its release in 2010. 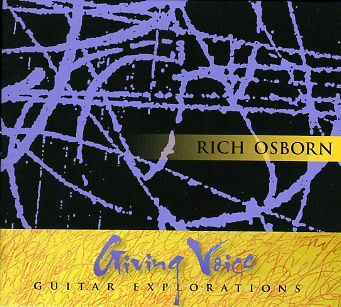 Richard’s interview from the series, as well as the liner notes from his latest album, Giving Voice: Guitar Explorations, portrays a very open sort of person, eager to discuss the details of his life and their effect on his music. I feel this is worth mentioning. For one, it’s refreshing to encounter someone who is straightforward; that makes no attempt to surround their endeavors in mystique. More importantly, Richard’s guitar playing sounds like an extension of his personality: not flashy or technique driven, but honest, and self aware. I tend to use variants of C tunings a lot for my “free raga style” work. They mimic the typical tunings used on sarods and sitars (which often have an F on top). I like the deep bass, and the clean sound of the tuning. The parallel strings of alternating tonic and dominant help to keep modal fingerings clear, moving from one register to another. It does help to have large hands, though, as stretches can span 5-6 frets instead of the usual 4-fret type scales and fingerings that many guitarists prefer. The way Rich utilizes open tunings is somewhat unique, in that he tends to develop melody with fretted notes on the lower strings while allowing the higher strings to ring open.² One hears this clearly in the slow, meandering opener of Giving Voice, “Into The Silent Land,” as well as the piece that seamlessly follows, “The Meeting Pool At Moonrise.” As Richard’s description implies, his tuning choices have a strong affinity with Indian music, yet his work never seems like a pastiche. Rather, it feels focused and disciplined, with the “raga” elements sounding as though they’ve evolved from careful study. Rain comes to bless a Franciscan retreat house in Danville, CA. The seemingly random patterns of nature lead to a way to generate new musical ideas and forms. In the seventies, Osborn studied and performed with the late Robbie Basho. Of course, Basho was and continues to be a revered figure within the world guitar soli, and Richard’s connection to him is undoubtedly a feather in the cap. One wonders, though, if a listener familiar with Basho’s work might harbor certain expectations when hearing Osborn for the first time. I myself only have a “working” knowledge of Basho’s catalog, but would like to think Richard successfully balances Basho’s influence with his own voice. My understanding is that Giving Voice was in the works for a long time. If it turns out to be Richard Osborn’s lone statement, then it certainly is a thoughtful one. Hopefully this is just a glimpse of things to come. ¹ A compilation of solo guitar instrumentals by Bay Area players produced by Sean Smith for Tompkins Square Records; the follow up to Berkeley Guitar (2006). ² Based on my listening, I feel safe noting that the more common approach to open tunings by American guitarists is the reverse: lower strings drone free while the higher strings are fretted to create interest or melody. ³ Richard typically plays a 1915 Vincenzo DeLuccia guitar. He discusses this instrument in greater detail in the 2010 interview.